It’s strange times. We know it, and everybody on the red carpet at the SAG Awards knows it; the ceremony was peppered with speeches about the fractured state of the union, as if everyone was both aware that it’s easy for things like this to look frivolous during political turbulence, and also as if everyone was so utterly gobsmacked by how little time it took to fracture that union that it was an impossible topic to avoid. Like Annalise Basso, we as a nation are hurling our gigantic chiffon scarves of outrage against the winds of tyranny, opening our arms against the tide of fascism like a drop-shoulder evening gown that actually lets you open your arms. 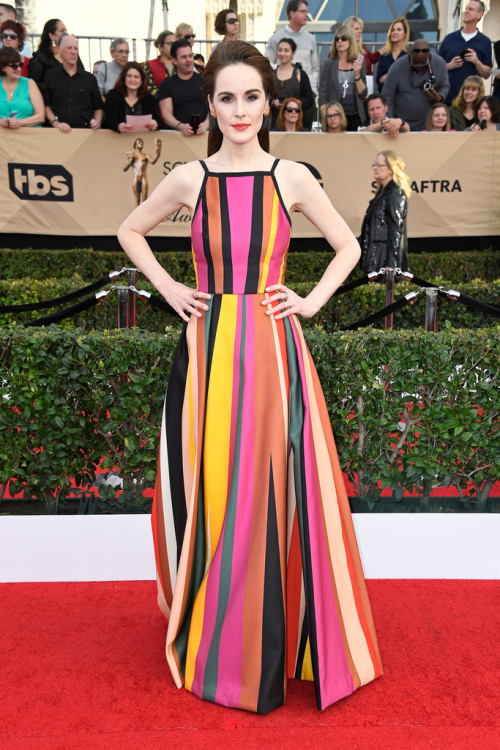 Related: I’m going to do this rundown, and we’re going to get into the usual A Slightly More Bohemian Red Carpet Is Not An Excuse For That Dress commentary. 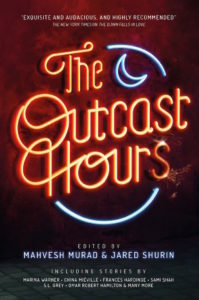 However, we’re going to open with a section of politicized outfits alongside potential organizations to consider if you, like me, want to do your part but also just want to look at nice dresses for five minutes instead of staring at Twitter in horror while you speed-dial your representatives with new things to lodge concerns about since the last time you called them four hours ago. Yara Shahidi, in the look of the night; bright but with a palette that stops just short of being candy-striped, and with that great, sharp shape on the bodice. She’s spoken publicly about the Muslim ban; you can donate to the National Immigration Law Center here, or investigate other organizations here. Gina Rodriguez, who is definitely able to wear a gorgeous skintight beaded dress like it’s a sweatshirt in fashion editorials, but still aware when in a skintight dress, you have to mark the waist with one hand, and pop one knee, and do all the things that a red carpet demands that you do so you can avoid Anna Chlumskying yourself by accidentally looking relaxed at any point, since being relaxed might affect the botanical and bird beading, and that’s the last thing you want when so many environmental protections are in danger from the new administration. Donate to the Environmental Defense Fund here. 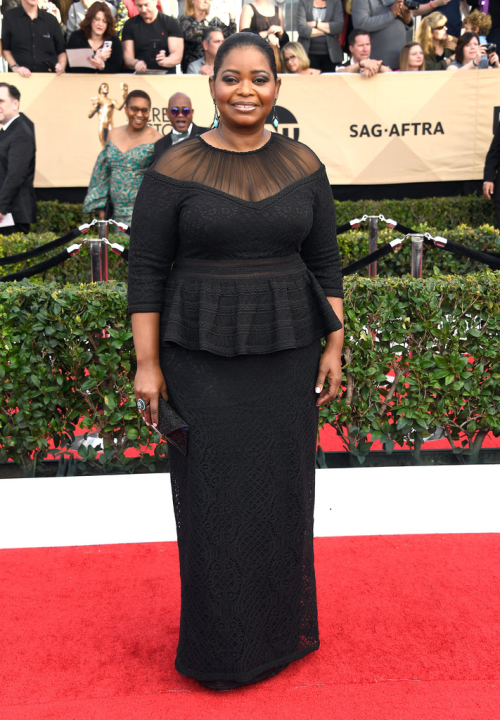 Octavia Spencer, whose red-carpet style is getting increasingly daring. The mesh neckline/drop-shoulder ratio feels slightly off – it’s vaguely the silhouette of a widow in 1840 who’s already making plans to reel in a young rake before he can blow off the rest of his fortune, which is a perfectly fine look, but maybe not also when you’re trying to sell that dramatic a peplum. Still, with this and her suit on the Golden Globes carpet, I like where she’s going. She also likes the ACLU. You can follow her lead and donate here. 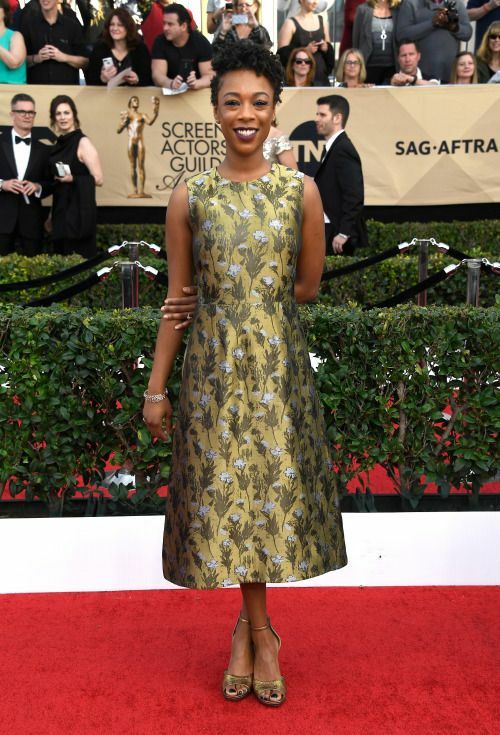 Samira Wiley, adorably dressed in a SAG-perfect cocktail sheath printed with what I can only assume is the 1957 Better Homes and Gardens textile of the year; coincidentally, an era when homosexuality was illegal and LGBT people had no labor or housing protections! You can donate to Lambda Legal here or GLAAD here. Emma Stone, bravely reminding us that even in times when federal funding to major cities is threatened, museums must not be allowed to fall into disrepair, like a delicately embellished dress that’s fallen away to reveal a 1994 Frederick’s of Hollywood bodysuit is the only thing keeping it up. You can find, and donate to, a museum in the city of your choice at Museums USA. 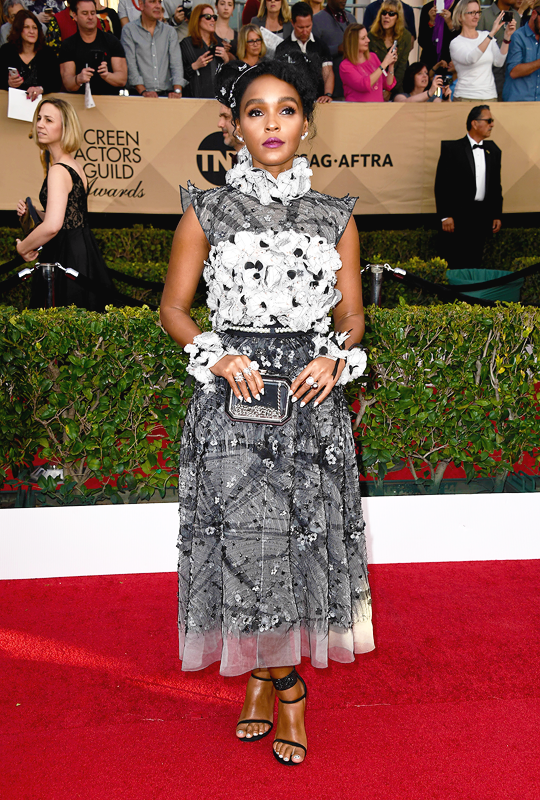 Janelle Monae, whose red carpet persona is a series of performance art pieces I have stopped trying to judge by any standard rubric; that skirt looks like nothing so much as a city map, which is surely a wink to how many protest marches we have and will see under this administration. She is an outspoken supporter of Black Lives Matter; you can participate in or donate to Black Lives Matter here. Natalie Portman, cosplaying as an iceberg in a bitingly on-point commentary about the ecological dangers of Arctic drilling. You can take action with or donate to the Sierra Club here. Angela Sarafyan, drawing our attention to the looming health-care crisis in a dress printed with what looks like penumonia, a disease that’s especially dangerous to those whose immune systems are compromised by, say, cancer, which is why low-cost access to cancer screening is so crucial. You can donate to Planned Parenthood here. Nicole Kidman, who knows that a government’s unwillingness to commit to climate change research means that protecting extant ecosystems will become more important than ever, except for whichever birds were killed for that shoulder treatment. You can donate to the Rainforest Foundation here. Samantha Isler. In one way, this dress is a 1970s BBC miniseries interpretation of an 1860s housecoat. In another, however, that sting in your eyes you get when you look at it isn’t only a color/pattern problem, but a reminder that America’s veterans (many of whom are joining protest movements against the Trump administration) are deeply under-served by the government; you can research and donate to any of dozens of veteran-specific charities here. Diane Guerrero, making a timely point about the dark cloud that oncoming fascism is casting across the arts, and the gigantic cut to public-access arts budgets in the wake of recent events. 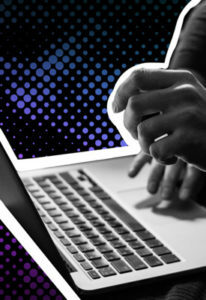 You can donate to PBS here or NPR here. Viola Davis looks great. Somehow she always manages to let us know necklines like this are ridiculous without actually looking uncomfortable in them. Fun fact: If she’d lost the award and a spontaneous protest had broken out about it, it’s likely that protesters would be arrested and require legal aid. Donate to National Lawyers Guild here or the the NAACP Legal Defense Fund here. Teresa Palmer’s Deco dress is great; it’s interesting to see the effect of a t-shirt neckline on a gown this intense, and her team undercut any risk of looking like she was taking the SAG red carpet too seriously by giving her very neutral makeup and the hair that TV always pretends women have after they’ve air-dried it while running after their incompetent husbands and insufferable children for 22 or 42 minutes, depending. It’s very soothing to see good work being done by people who want to help, isn’t it? Donate to the Southern Poverty Law Center here. 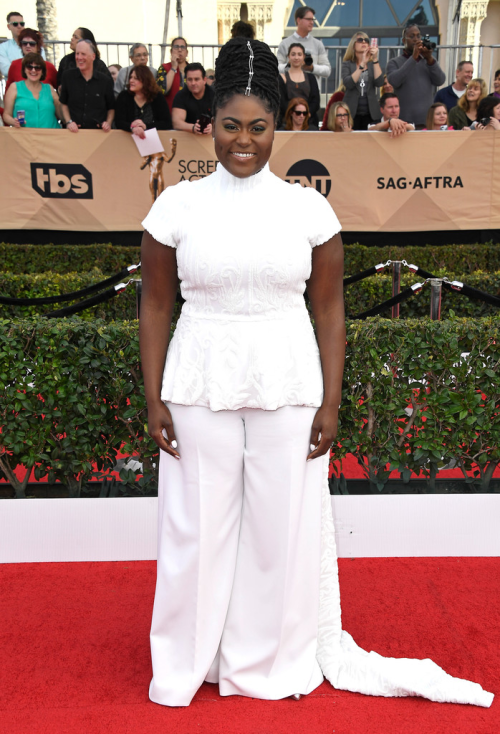 Danielle Brooks, who’s usually rock-solid on the red carpet, but has chosen to wear an outfit that somehow looks more like a deeply influential diplomat visiting the NCC-1701-D to finalize negotiations for joining the Federation. You can honor her vision for this outfit by supporting the future of Black girls in science fiction and donating to the Octavia Project here. Kathryn Hahn. Like this dress, the Dakota Access Pipeline is a poorly-planned disaster that needs to stop. You can donate to Stand with Standing Rock here. Of course, not everything on the red carpet was a political statement. Some people were unaware of my plans for this blog post and just wore regular dresses that they hoped I would get to afterwards! For the SAGs, they generally end up in a single division, because this is the red carpet equivalent of a fancy cocktail party at somebody’s summer house. Everybody wants to look good because it’s an Event, but they also want to look different from everybody else in a really fun way that just reminds other actors how fun and special they are. In some ways, this is interesting because it’s implicit permission to break from the unspoken traditions of 1) maintaining your current character in an extremely low-key way throughout awards season, or 2) secretly using the carpet to audition for other stuff, and the results are always interesting. Gretchen Mol, accessorizing her goth flapper with a medallion to summon He Who Casts No Shadow from the depths of the Other Realm, in case the party goes late and they need a designated driver. 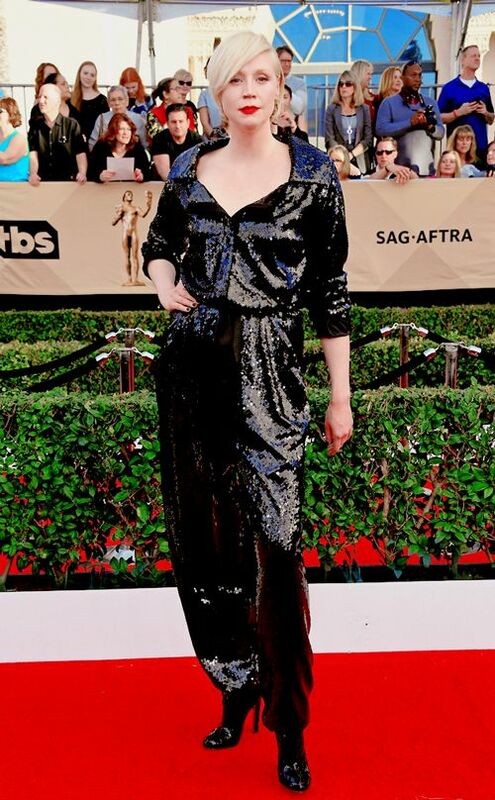 Gwendoline Christie might be a spaceship pilot now, but she’s never going to give up her goth-punk roots. Never. Ride or die. Kirsten Dunst, who has accessorized her filmy white dress with the half-hearted rictus of an actress who wants nothing more than to play dour jerks for the rest of her career because she is tired of pretending that she was ever an ingenue; she has belonged in the punk enclave since she played a tiny, bitter child vampire. Claire Foy, trying the end-of-Grease makeover in an attempt to sneak into the punk enclave. It mostly works! It’s certainly a dress that keeps you looking; I’m just not sure that prolonged exposure does this dress any good. It’s still a smart choice for her as she tries to shake off any suggestion of dowdiness in the wake of Queen Elizabeth, but compare this to her look from the Globes and you can tell that this one wears her in a way the other one didn’t. And if you didn’t make it into the punk enclave, there’s only one place left to go. Thandie Newton. I went on a journey about my feelings for this dress, because if you asked me about any particular aspect of it, I’d probably agree it’s a bit odd. (Blue lining on the football-pad shoulder? Disconnected black velvet collar on top of a dress that, in the red-carpet lighting, looks not unlike oatmeal? Stylizing your carnival-horse print to look like cave paintings?) However, Thandie Newton has shown up to this red carpet feeling goddamn great about her dress, and she’s openly daring anyone not to like it, and sometimes open hostility is exactly what you want from a look, so my final verdict is that she looks great and I won’t be able to explain why. Evan Rachel Wood wore a tux again! It’s beautifully fitted (the satin lapels are perfectly cut to both emphasize the breadth of the shoulders and to draw the eye up instead of out). I didn’t look, so let’s just hope she didn’t make another speech about it. Clea DuVall’s suit is incredible, and honestly, I really like that the jewelry is so understated; the impulse to do chunky jewelry is always there when you’re suiting someone up for a big photo op, but the restraint really works. Pristine “the SAGs are a cocktail party” vibe. See? Tracee Ellis Ross’ dress isn’t catching on anything! That business is a well-oiled machine. Bryce Dallas Howard, in very nice 1930s merlot sequins. She has not yet mastered the art of looking relaxed on the red carpet, which will affect her overall look until she works it out. Maisie Williams. 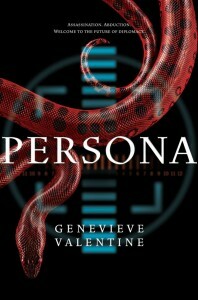 I really like this look for her; she seems slightly less convinced, though that might just be this photograph. It’s definitely one of her first tries at the classic “lie down in the back of the car so your dress doesn’t wrinkle” silhouette, but pairing it with the noir lip helps keep it interesting. Emily Blunt. Part of me understands and appreciates the Versailles-fancy-dinner-plate details of this look, and it’s a great evening sleeve, which I’m always a sucker for. But 1) the beeeeeeeige, and 2) that underbust detail. Amy Adams has generally settled into a sleek, understated red carpet routine that makes sense for her; the selling point of this look is the jewelry, which might be the best jewelry she’s ever worn. Slightly unusual, perfect for her eyes, and highlights the sharp line h of her decolletage by drawing attention away from it. Salma Hayek. Look, do I think this is reminiscent of the Easter Barbie 1986 Special Edition? I do. But look at her. Are you going to tell her that? I’m not gonna. Naomie Harris. I really like the idea of this outfit. I’m just not sure I like any actual aspect of how it turned out, except that Naomie Harris is in it, and that’s just not enough this time. I was wrong before; Anna Chlumsky’s team is definitely doing image control after the Golden Globes. There is no possible way to crease, fold, or balloon this dress into the suggestion that, horror of horrors, she might have gained weight; this dress is not going to leave one ounce to the imagination. And last: Who keeps doing this to Kaley Cuoco? Who keeps letting this happen.